Christian leaders in Jordan on Wednesday established "beyond doubt" that the country hosts the holy site where Jesus Christ was baptized by John the Baptist on the east bank of River Jordan. They denied an Israeli claim that Jesus Christ was baptized on the west bank of River Jordan at what had come to be called the Judith Church, which was recently renamed as "Baptism Church" by the Israelis. 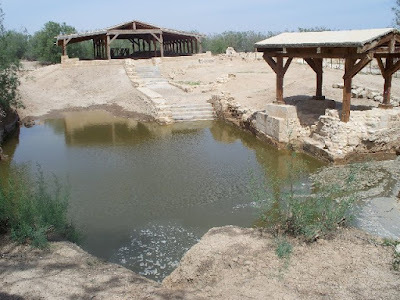 "There is no doubt that Jesus Christ had been baptised on the east bank of River Jordan and that the site was honoured by Christians from the early days of Christianity and still so until nowadays," said a statement issued by leaders of churches in Jordan. They pointed out that they decided this fact in accordance with biblical texts, Christian traditions, excavations as well as testimonies and writings by many pilgrims who visited the area since the second century. Similar remarks were issued on Monday by the Orthodox churches of the East which met at the baptism site, about 25 miles west of Amman, in response to an invitation by Patriarch Theophilos III of Jerusalem. The Rev. Nabil Haddad, president of the Jordan Interfaith Coexistence Research Centre, said during the meeting that all Christian religious leaders considered Jordan's baptism site as "the actual place where Christ was baptized, which affirms its authenticity and refutes Israeli allegations that claim otherwise". Jordanian Interior Minister Mazen Saket said the baptism site was recognized by several top Christian leaders and historians. He pointed out that the site was inaugurated by the late Pope John Paul II in 2000 and was blessed by Pope Benedict XVI during his pilgrimage to the Holy Land in 2009. "We were shocked in Jordan to see the Israelis inaugurating a new site on the west bank of River Jordan and naming it the Baptism Church despite well-known historical and religious facts," Saket said.